The carpeting in the L was original--what was left of it. I'm sure it had been saturated with this and that. When I got the car in 2004, the carpet looked ok, but there was no backing, and the front piece had been cut in half at some point. The jute backing had been stripped away, and here and there the thing was unraveling. I improved it by putting new carpet underlayment on the floor, cutting it to fit and then putting the old carpet over it. That worked for a while, but last summer the thing began to move around and affect the accelerator. Time for replacement. I had a chance conversation with Gary Goers at the meet in Carmel, and asked if he sold L carpet. He managed to control his enthusiasm for such a sale, and suggested I contact AAC, or StockInteriors.com He said they had the carpet, ready molded to fit the floor pan, with the jute backing attached. He said my biggest problem would be attaching the front mud plates to the carpet--but contact cement would work well. He didn't want to have to sew them on--as was done originally. If you order from them, make sure you ask that they exclude the rubber heel pad, and that they do send a headlight dimmer switch grommet. 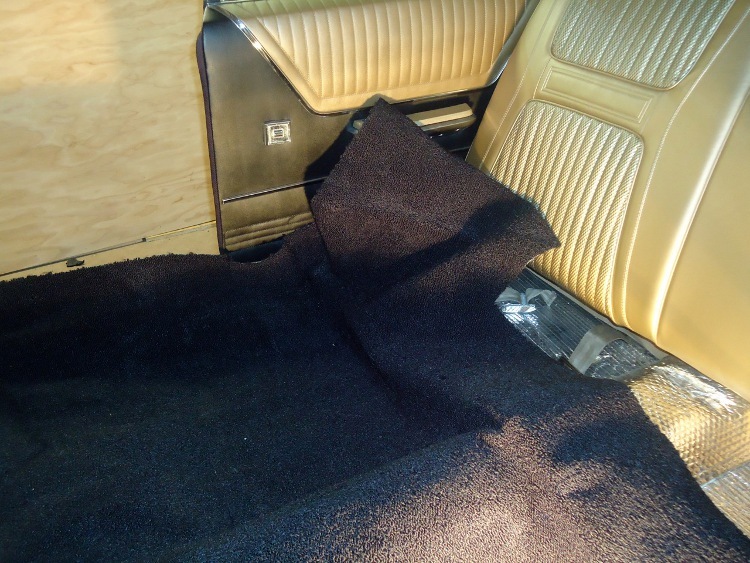 After dithering, I ordered the carpet set for a 65 Chrysler 300 in black. I asked them to send a headlight dimmer grommet and not attach a heel plate by the accelerator location. They sent the thing promptly; that was very good. I followed their instructions, of unwrapping the thing as soon as it arrived, and spent some wife school points laying these new yards of formed carpet out through two rooms in the house. (Herself did complain a bit.) Opening them up and laying them out also makes you form the carpet to the molded shape that was made at their factory. These shapes will then fit--more or less--into the floor pans. There is a cautionary tale here. Be sure to check the bottoms of your new carpets. Since the two pieces are almost interchangeable, the best way to tell which one goes in front is to look at the bottom side and determine where there are jute cutouts for the headlight dimmer and the accelerator. Their instructions for installation are pretty good, except--as you know--a Letter Car creates its own issues. Fitting the rear carpet is easy. You will need to make cuts for the prongs which hold the rear seat down, and you will have to trim at the sides. I found that the carpet going over the hump is slightly larger in diameter than the hump--that it is not a tight fit, and there was no way to make it so. Nonetheless, the rear piece is easy. If you have front seat belts, you will want an awl to locate the bolt holes, followed by "x'ing" them with the knife. 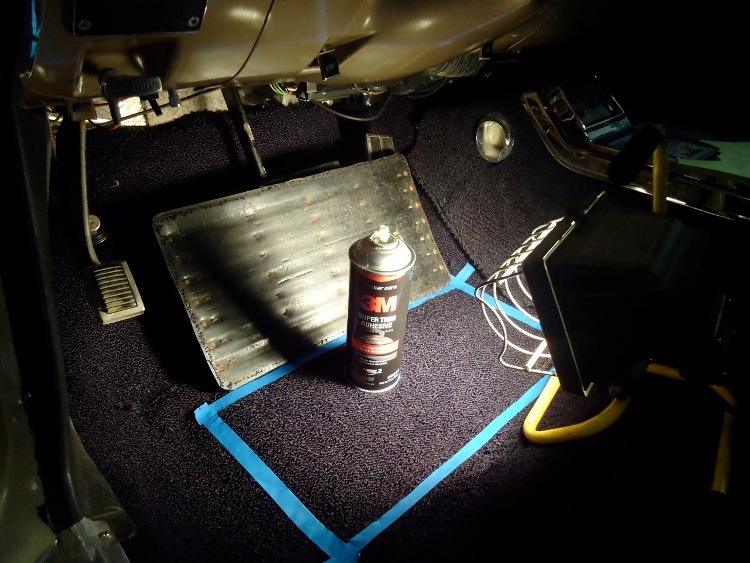 When I had the hole, I then put a couple of strips of black duck tape around the edge of the hole to keep the edge fairly protected, and to keep the seat belt bolt from grabbing carpet as it turned in. The front piece in letter cars from 60-65 is, as a colleague once said--"a horse of a different flavor." 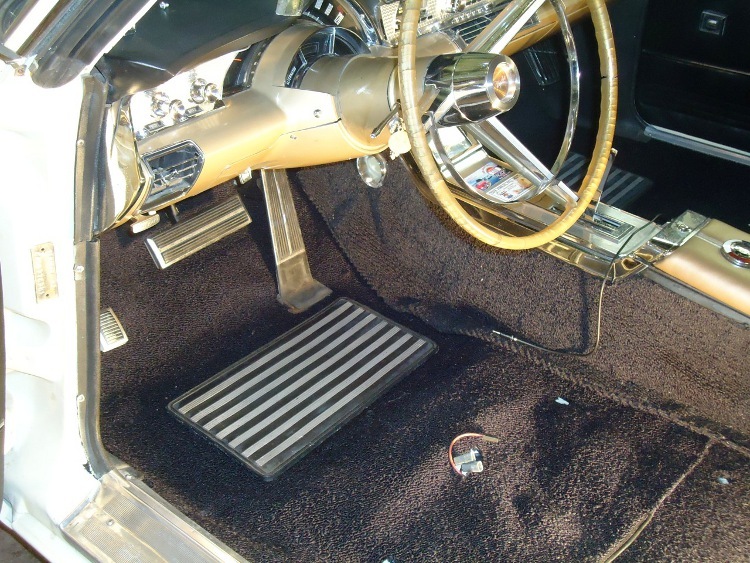 The carpets are made for cars without consoles and with bench seats. Jute padding is pretty thick as it covers the transmission hump. For cars with no console and bench seats this makes for an easy application. For cars with consoles and bucket seats, this requires sharp knives. Cuts are required for the tangs that hold the console in place, and for the shifter on a 4 speed car. 12V wiring for the console will come up alongside one or more of the tangs, and the tang cut can accommodate that wiring. Getting the carpet set correctly, both fore and aft and side to side is tricky. Lots of chalk marks and chin rubbing and thought before the knife cuts will help to assure that you don't cut too much. 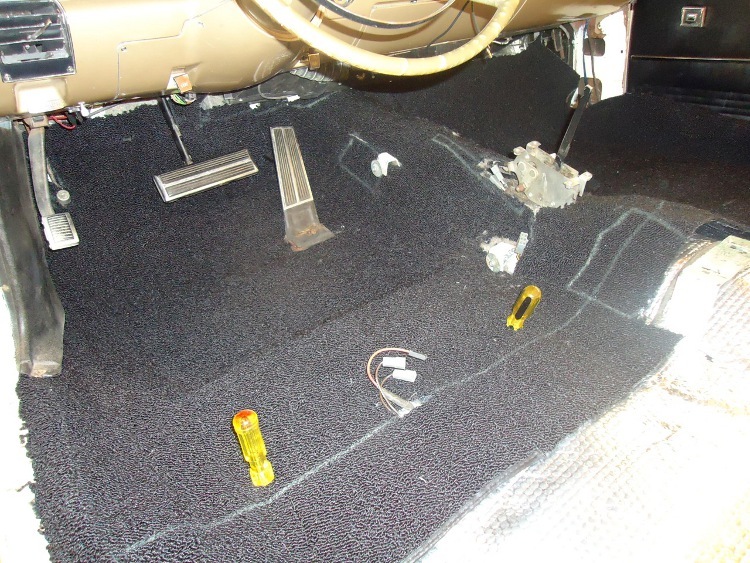 For automatic transmission cars, and for the vacuum/tach connections and p/w switches, a notch at the very front of the carpet will allow you to reeve the cables and tubes over the carpet to their appropriate place in the console. 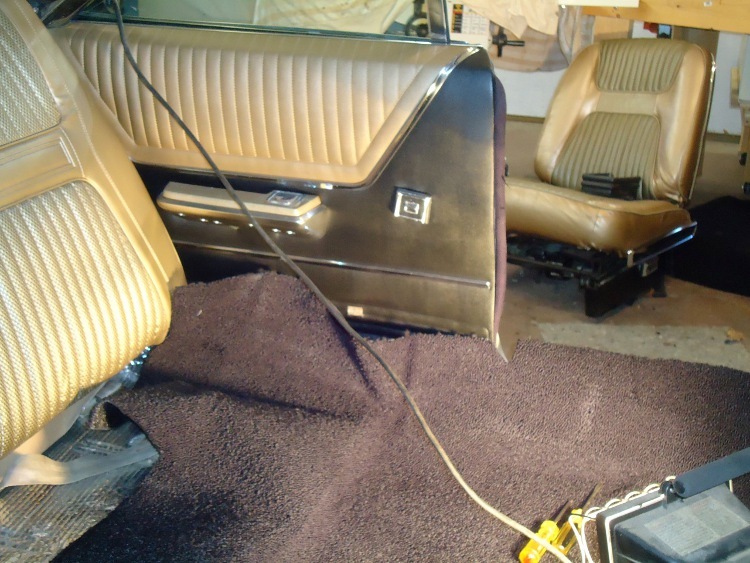 (I thought about leaving all those connector and tubes under the carpet, until I realized that removing the console and dealing with future transmission problems would be tougher with the carpet on top.) 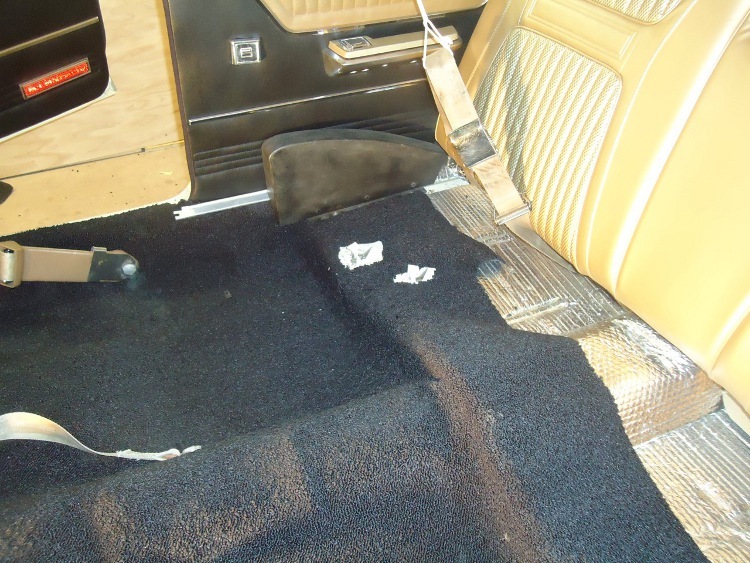 As with the rear, the hump in the carpet is slightly larger than the actual transmission hump itself. 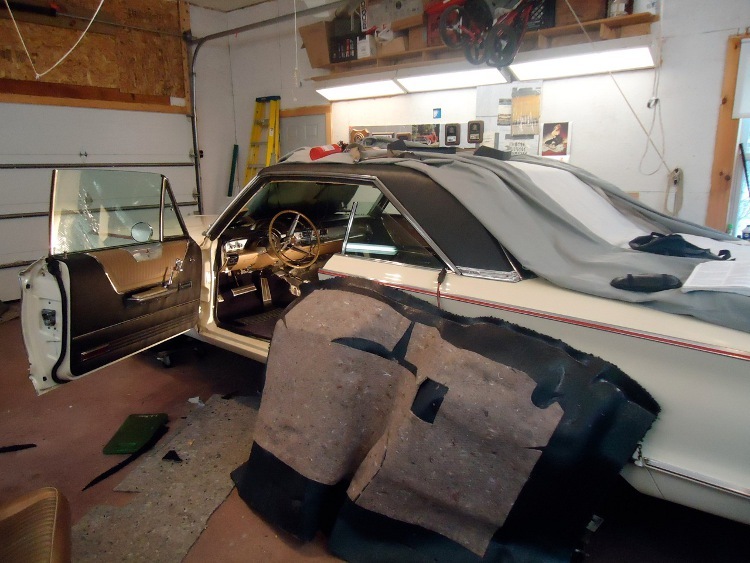 Getting the front carpet settled, fore and aft and side to side is necessary before you make cuts for the accelerator, the headlight dimmer switch, and the emergency brake cable. Trimming the front sides, by the kick panels is also a challenge--since the oversize carpet will fight you a little as you try to get the whole thing placed. Only after you have the carpet where you want it, with the headlight dimmer switch grommet, emergency brake cut, and accelerator cuts made and accelerator back in place, should you find the seat bolt holes and cut for those. I used an awl to locate hole placement, and then "x'd" it with the knife. When I had the hole, I then put a couple of strips of black duck tape around the edge of the hole to keep the edge fairly protected. If you have a power seat, a small cutout for the wiring will be necessary. If you have the mud/foot pads that are in my L (quite heavy rubber and aluminum affairs), removal from the old carpet should be pretty easy. If the carpet is as old (well, it has to be doesn't it) as mine, and as rotten, the things almost fall off. They were sewn on, and any threads still left can be cut and just about rubbed off. Cleaning the things well, on both sides is important--the top cosmetically, and the bottom for adhesive purposes. The things may have warped a bit, so warming them and then weighting them to become flatter will make a better application. I placed my pads about an inch ahead of the ledge on which the seat base is bolted. I centered the right side pad, and ran the right side of the left mud pad at the right edge of the accelerator. I used spray contact cement, and actually read and followed the directions. 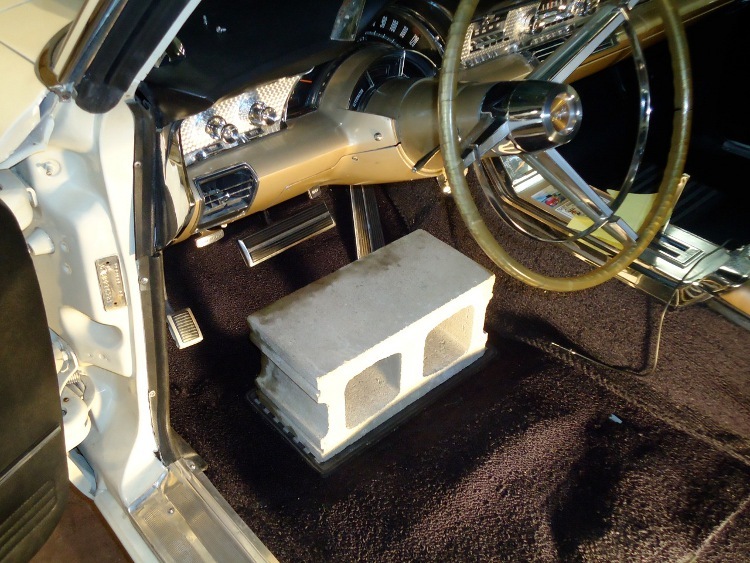 When I put the pads in place with the cement dried to the touch, I then placed a regular cinder block on each for 24 hours. I don't know if the weight made a difference, but the things are still stuck where I put 'em. I am happy with the result. My knees and shoulders paid a heavy price, but I like the look and feel of the new carpet. I think the car is quieter inside, but my wife reports that my ears are worse--so who knows.